State 1 is where the model always starts (but you cannot get there any other way) and states 8-10 are absorbing states (meaning once the model gets there, the process is complete and we cannot move to any other states). I ran my own numbers for the Mid OT states and keep in mind that they are just estimates based on similar historical situations -- down 3 points nearing the end of regulation with enough time left to make an actual drive. We will not know exactly how accurate these estimates are until there is a fairly large sample size of new overtime format games in which the Mid OT state occurs (that could be 5-10 years from now). Also, one assumption for the opening drive numbers is that coaches will not act differently in overtime than they would in regular. This is a large assumption, but it should be true if coaches are making decisions optimally. We can then do some matrix manipulation to determine the probability of winning, losing and tying for all seven of the transient states (non-absorbing). Notice that receiving the opening kickoff still has an advantage in the new format. 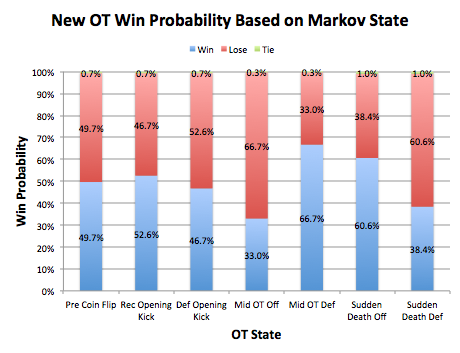 If you kick a field goal on the opening drive, based on our Mid OT estimates, that equates to a 2/3 chance of winning the game. So why is this helpful? Using these probabilities, and especially the transition probabilities, will provide a baseline for overtime decision-making. There are tons of interesting and unexplored questions since the format is so new. Should you kickoff onside to open overtime or Mid OT (debated in the comments of Brian's article)? When should you go for it on fourth down in each state (see Brian's analysis for a good starting point)? Incorporating time left into the analysis is extremely difficult, but the new format definitely means there is a greater likelihood of tying. In fact, the above tie numbers are only based on the historical sudden death numbers. We can adjust this by looking at the average time left in the new overtime when teams reach sudden death and comparing that to the percentage of historical sudden death games that lasted at least that long. Again, we'll need enough data to accurately calculate expected time left at the start of new sudden death. Interesting reading. It will be interesting to see how things play out after a 1st possesion FG. Since it's been shown that punting is usually a poor strategic decision the team receiving the ball after a FG has a huge advantage since they are now forced to go 4 it on 4th down their scoring percentage will be much higher than it otherwise would. The only question is, by how much? I want to know more specifics. Is there be a "confidence" interval in regards to the data? How confident can we be that X is the better decision? What if base data says to pass the ball rather than run, or pass heavy balance. How conclusive is that data? The 4th down chart on this site for example is great... but how confident can we really be that one should go for it in a situation on 4th and 5, but not on 4th and 6? That seems like too hard of a cut off to reflect reality which is more than likely more of a blur that seems to cut off around X yards in a given situation. But how wide is the blur? Is it possible that going forward the average team should go for it in 4th and 10 rather than 4th and 8 being the cutoff? How probable? Is there any idea or concept of variance when determining all of the conclusions on these sites? I know there are statistical calculations to estimate the probability that X>Y. You'd probably need to say over the next 5 years so you have an idea of the actual population, or else look at an individual team and determine how much the average team is reflective of the whole so you can say how relevant the base data is for a random individual team? There are definitely error ranges in all the calculations and the less data we have, the larger that range will be. You have to consider two main things though when asking those cutoff questions: 1) These are just baseline rates, they will be affected based on matchup and situation. 2) They do not say you MUST do this or must do that. 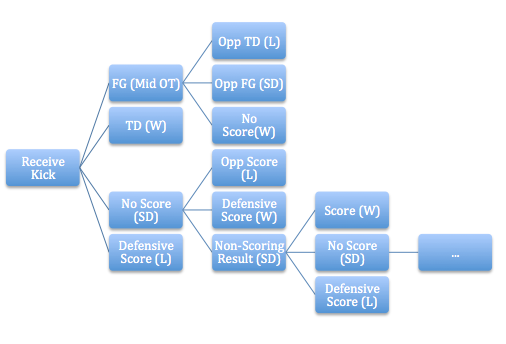 Game theory has a huge impact on NFL decision making and it is necessary to be variable in your strategies. While this is not as big a deal in 4th down decisions (whether to go for it or not) as it is in pass/run balance, it still has an effect when you have the options of faking and what type of play to run in the situation. Speaking to pass/run balance, the quarterback is often expected to make reads that change a play from a run to a pass between the time that the play is called, and the ball is snapped. Similarly, the quarterback scramble is a run play that may have been called as a snap. As such, I think the statistical modeling has to get a bit more sophisticated before it can inform that type of playcalling with credibility and confidence.